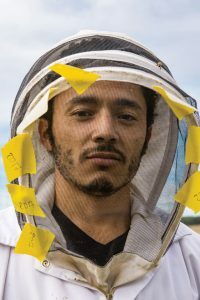 Every year hundreds of men from Central America and the Philippines come under the Temporary Foreign Worker Program to work as beekeepers in northern Alberta. In 2018 Canada produced $196,600,000 worth of honey. The industry indirectly contributes billions to other sectors such as bee-pollinated crops. Alberta alone produces up to 45 per cent of the nation’s honey. 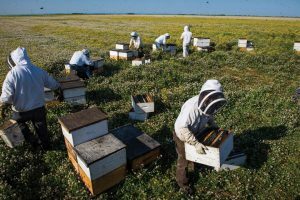 The Peace River Country, known for long, warm summer days, cool nights and abundant clover fields, is a well-established area for honey production. Workers can send up to 70 per cent of their income back home by minimizing their personal expenses. As the summer progresses the beehives will mature as flowers and food sources increase. The bee season starts in winter and ends in late fall. 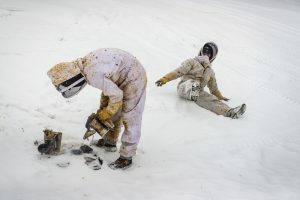 Often originating from tropical countries, workers have to cope with northern Alberta weather. 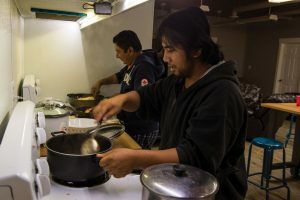 For coworkers Ryan Enor Duyot, at right, of the Philippines and Bosco Montalvan Lopez from Nicaragua, friendship is essential during their eight-month work period. 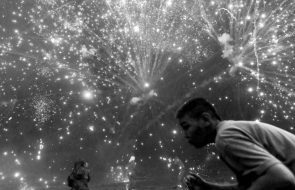 Jose Miguel Rueda Maldonado works and lives with two of his relatives from Nicaragua.